It was back to my roots for Three Friends and a Fork this week. We traveled to nearby Marshall County and the town of Arab, (rhymes with Ahab). There is a story there, which I will share in a bit. But first, a little background. My family moved to Arab in 1964, in the middle of one of the biggest snowstorms to ever hit the area. My dad worked at Redstone Arsenal in Huntsville, and my parents liked the idea of raising a family in a smaller town, so we moved, along with a lot of other folks who also worked at Redstone. My daddy tells me that there were so many Redstone Arsenal families moving to Arab at the time that the local Arabians called us by the derogatory term, "Arsenics". Funny, I never knew that then. If people don't like you and you don't know it, it must not matter too much! I guess they were concerned with how their little community might be changing with all the outsiders coming in so suddenly. But come we did and we soon learned to love the little bedroom community about 30 minutes south of Huntsville. 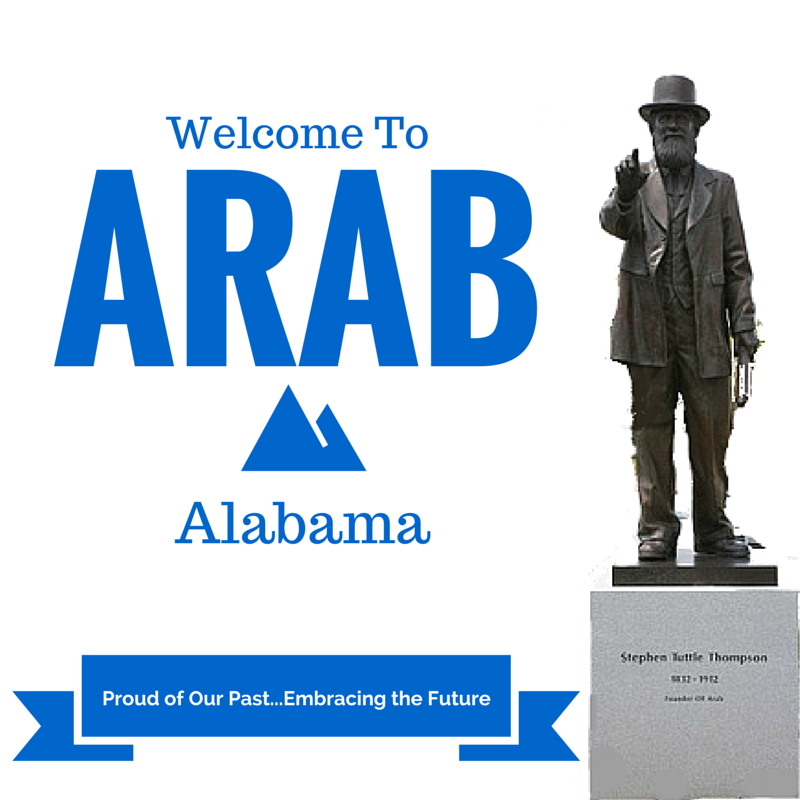 I don't know if anyone knows with absolute certainty all of the exact details of how the name Arab, with the funny pronunciation, came about, but the most commonly told story, and the one that was printed in the front of all our phone books, was that the town's first postmaster, Stephen Tuttle Thompson, was the person who chose the name. He submitted three unusual names for the new town, Ink, Bird and the name of his son, Arad. Of the three, Arad was chosen, but somehow, in the paperwork, the d got switched to a b, so Arab was born. I'm thinking Tuttle Thompson would have fit right in out in Hollywood, with his penchant for odd names. Arab is a little town with a big personality. Even now there are only about 7,000 residents, but that smallness never shaped the opinions of the community when I was growing up. For some reason, as a group, Arabians have traditionally always had lots of optimism and confidence. Maybe it was the fact that we were perched high atop beautiful Brindlee (or Brindley) Mountain. Maybe it was the attitude of the Arabians who came before us and it just rubbed off. Maybe it was because, economically, Arab wasn't a community of great extremes, so we didn't get the feeling that anybody was better off than any of the rest of us. It might have been because Arab was a safe place to grow up and, since we didn't have to worry about our safety, we could concentrate on becoming rather than surviving. Or, perhaps, that unusual name, Arab, made us feel special. I don't know what it was, but I know I wasn't the only one of my friends who felt that kind of confidence and optimism, and from the conversations I have had with many of them in recent years, it is something we have been able to maintain. I have also learned, since I left Arab, that the high opinions we held of ourselves were not necessarily held by others. Let's just say, I was surprised to find that other people, in other nearby communities, were not as impressed with us as we were! Nevertheless, the confidence and generally sunny outlook I learned growing up in Arab has served me well and I think many of my classmates would say the same. As Taylor Swift would say, "Haters gonna hate!" Arab is still finding ways to overachieve. From the school system which consistently receives high marks and the high school band which is one of the most celebrated in the southeast to the stellar productions of the high school musical theater, Arab is the little engine that could. Speaking of the musical theater, that was the reason for this latest visit. Luanne had an appointment in Arab on the same night that the musical theater was kicking off a performance of Bye Bye, Birdie at the high school, so she asked Lavinia and me if we wanted to meet her for an evening of dinner and theater. Of course we said, "Yes!" 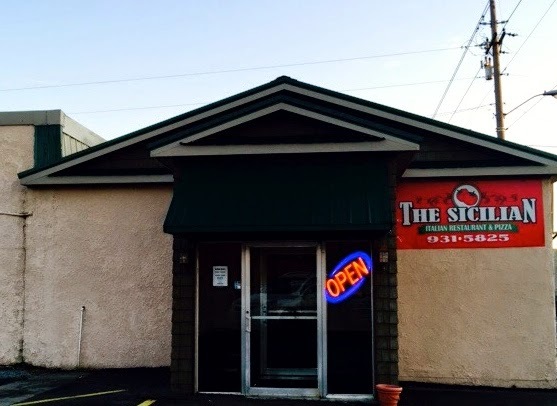 We decided to eat at a place called, The Sicilian. Luanne had learned that the owner was from Greece and a friend of hers had said the food was authentic and delicious. When we pulled up to the outside of the building, I will admit to being a little skeptical. The outside is not much to look at. I remembered the building as being a dry cleaners when I was growing up. We went on in, hoping that Luanne's friend was giving us good advice. We were glad we did not let the outside appearance deter us from venturing on in. Once inside, we were warmly greeted and quickly seated, menus were delivered and our drink orders were taken. 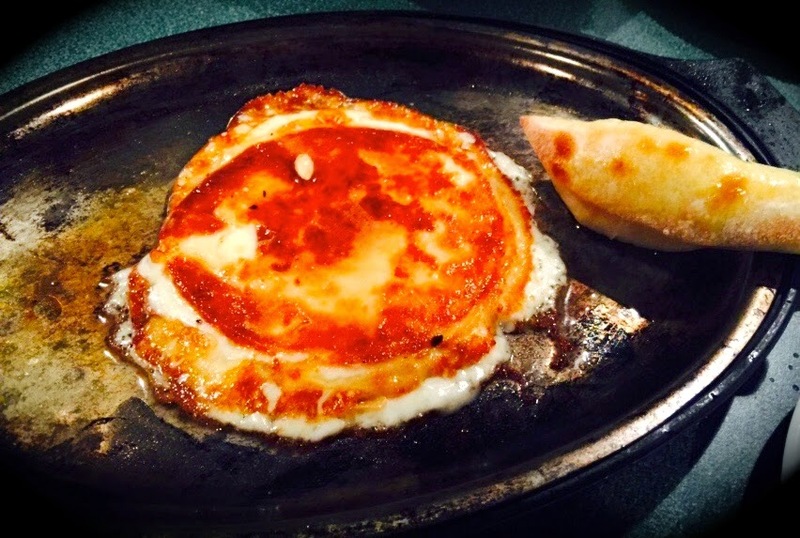 We decided to order an appetizer of flaming saganaki or, in lay terms, cheese on fire! We were as interested in the presentation as we were in actually eating the appetizer. The saganaki came with a basket of homemade bread that was delicious. 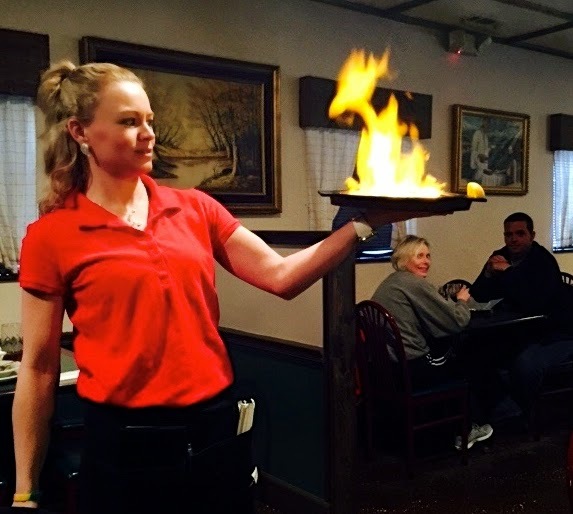 Our server bravely lit the pan of cheese and the entire staff yelled, "Opa!" 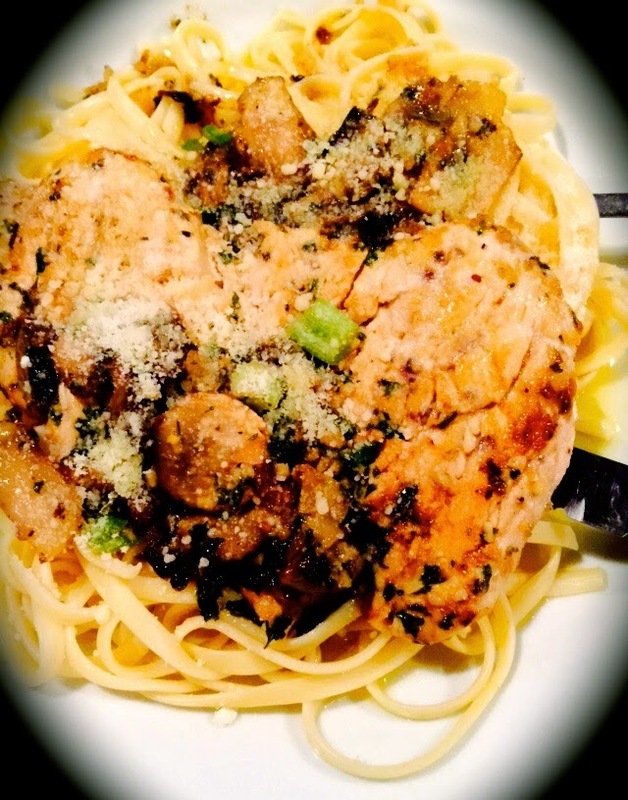 Lavinia ordered chicken marsala, a dish of thinly sliced chicken cutlets, grilled, covered in a buttery marsala wine sauce and served over linguini. It was delicious! 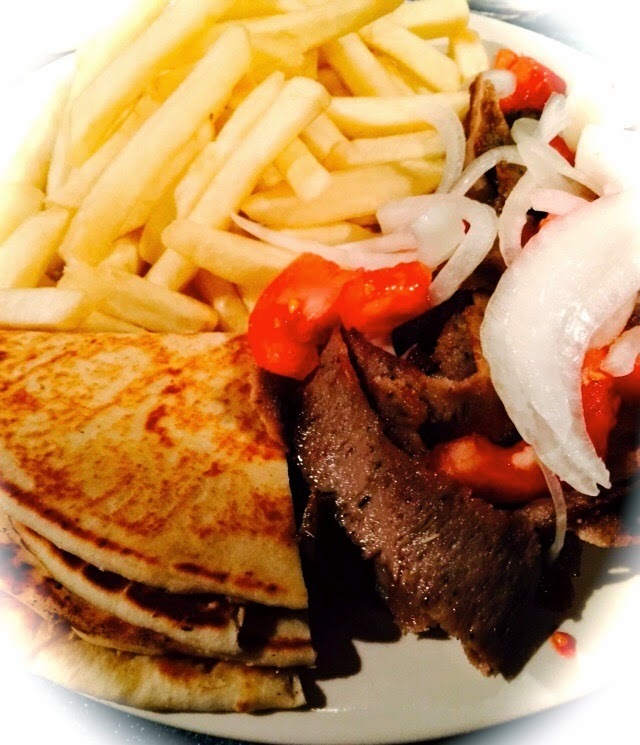 Luanne went with a gyro platter of thinly shaved beef and lamb topped with onions and tomatoes and served with tzatziki. It reminded me of a Middle Eastern version of fajitas. Luanne loved it. It came with pita wedges and, curiously, French fries. Luanne's condiment phobia prompted her to ask for the tzatziki to be served on the side. I was glad she did, because she shared it with Lavinia and me. We all liked the tzatziki, by the way. 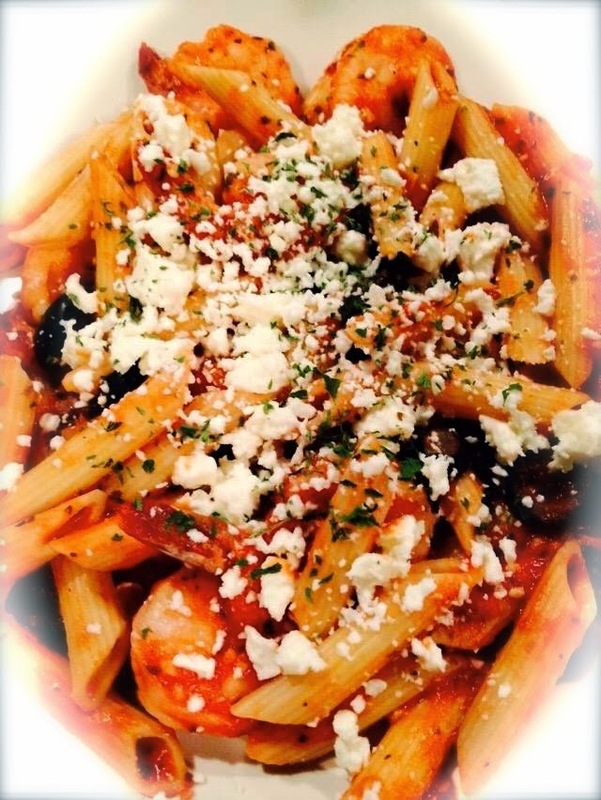 I opted for a Greek style pasta called Pasta ala Greco, which was penne pasta tossed in a red tomato sauce with black olives and feta cheese. I ordered my pasta topped with grilled shrimp. It was very good and very filling. In fact, all three of us had lots of leftovers. The portions were generous. As stuffed as we were, we each took one for the team and ordered desserts, which are all made in house. Lavinia picked the creamy cheesecake, Lu couldn't resist baklava and I got a Greek custard encased in phyllo called galaktoboureko. Every single one of our desserts were delicious. 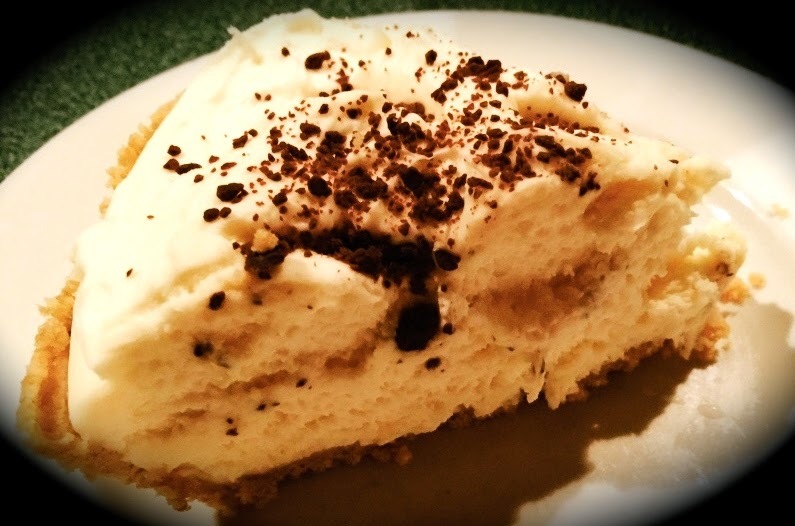 Lavinia's cheesecake was rich and thick. 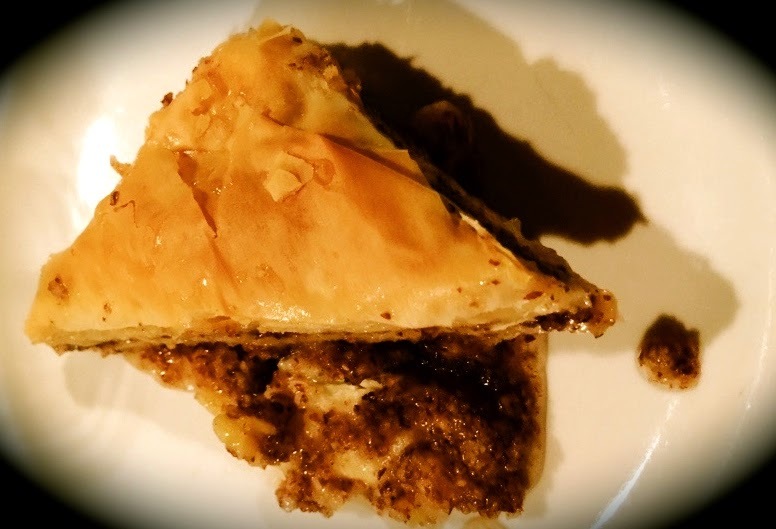 Luanne's baklava was sweet and sticky. 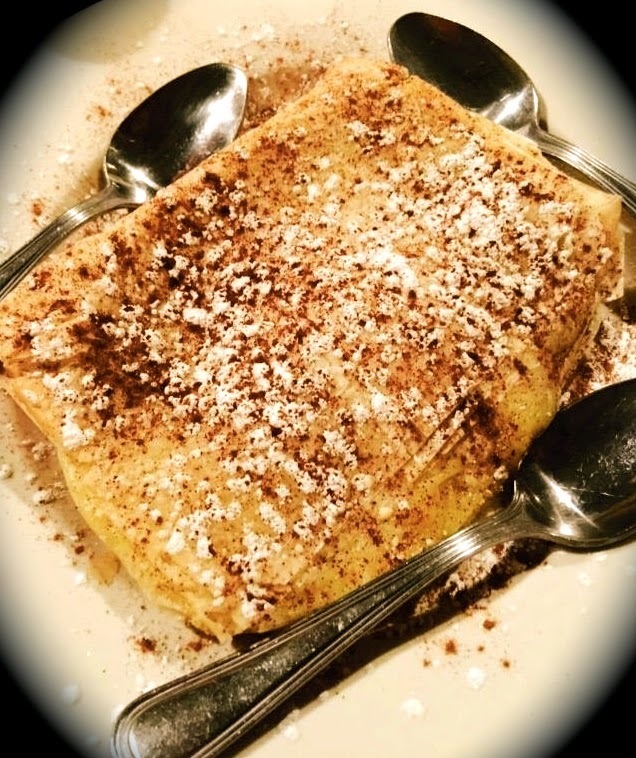 My galaktoboureko was warm and cinnamony. 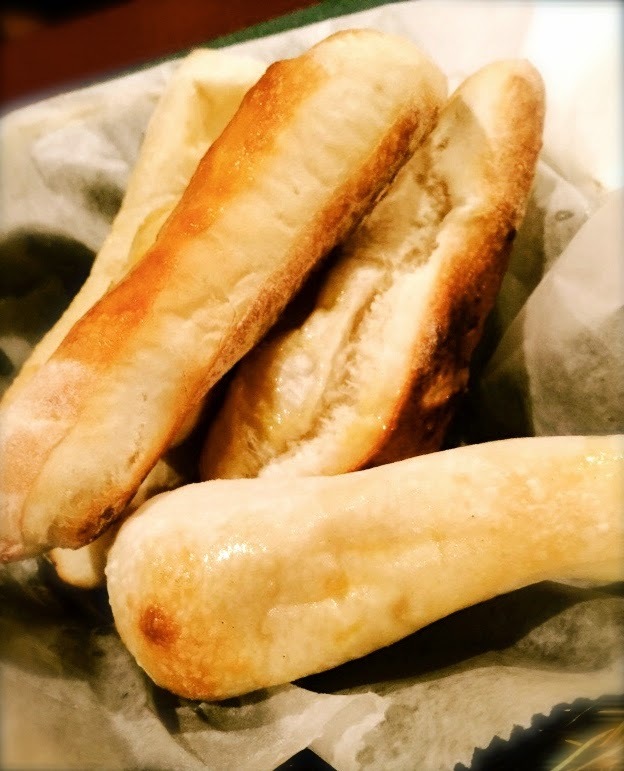 Overall, our favorites were our wonderful Greek salads, the warm breadsticks, Lavinia's chicken marsala and my Galaktoboureko. But, really, it was all delicious. After we left the Sicilian we scurried over to the high school to watch a very professional presentation of Bye Bye Birdie by some super talented high school students. We were not disappointed in the night's entertainment either. When I tell you that the performance was professional, it is no understatement. Arab's Musical Theater is one of the best programs in the state. Who knew...tiny Arab with authentic Mediterranean cuisine and Tony worthy musical theater? But then, Arabians are overachievers! Three Friends and a Fork are proud to give The Sicilian and Arab's Musical Theater 3 creative Yums UP! Opa! Oh, this place sounds wonderful! You make me want to be there. I think you all must have a very good time doing this and getting to spend some fun time together. I would have loved to see the musical too. Richi, you do a good job writing. It just keeps me spellbound. You are talented!